Summer’s answer to the roasted kale chip? You guessed it. Go fire up the grill. Seems there’s a new kale chip in town…. 1. Prepare a grill, preferably with some chunks of maple or oak thrown on the fire, on medium heat. 2. Rinse the kale and pat it completely dry. Strip away and discard the stems from the kale. Tear the leaves into large bite-size pieces (large enough so they don’t fall between the grates of the grill) and toss them with the olive oil and a good pinch salt. Arrange the kale in a single layer on the grill rack. They will begin to sizzle almost immediately. This is a good thing. Resist the temptation to turn them. The burn is good; the burn is your friend. After 4 to 5 minutes, flip the leaves once to give a slight char to the other side of the leaves. Cook for another minute or so, then transfer the kale to a platter. That’s it. Serve immediately. Quote from a professional chef at our barbecue: “What a great reprieve from all the meat here….” This was a perfect addition to our meat- heavy cookout—even the carnivores were curious to see the big leafy greens on the grill. The leaves picked up a smoky, meaty aroma, and were nice on their own or on a burger. They were a bit like kale chips, but with smoke. The cooking time was accurate. I’ll be making these at many future barbecue gatherings. Did you take one look at the recipe and ask yourself, “Why didn’t I think of that? !” I did. I tend to avoid turning the oven on during summer, so what fun it is to find a recipe that turns a hot commodity into a summer-friendly hybrid. I cannot think of anything easier and more efficient than harnessing the residual heat of the grill after cooking your mains to roast a bunch or 2 of kale. Simply scatter the leaves on the grate and then heat the big, nubby, blue-green leaves until they’re spotted with char. I stuck to arranging them in a single layer and this proved successful in providing a uniform cooking time from top to bottom, left and right. The charred spots are pronounced and complex tasting. I see them being an awesome garnish over a myriad of dishes. And they’d stack up nicely next to a cold, hoppy beer. 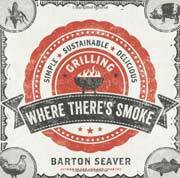 Grilled Kale Recipe © 2013 Barton Seaver. Photo © 2013 Katie Stoops. All rights reserved. All recipes and photos used with permission of the publisher. Yep, why DIDN’T I think of this?? If it would just stop deluging by dinnertime, I’ll try these tonight. Fingers crossed, Judy, that you make it to your grill! I agree–why didn’t I think of that, so I could avoid heating up the kitchen for my kale chips? Has anyone tried just grilling the kale leaves whole, then letting people nibble the leafy parts off the stems for themselves? Maybe I can save that prep time, too…. Love that, NancyB! We didn’t, but chances are someone out there has…anyone? I did give grilling whole kale leaves a try, but I don’t recommend it. The grilling part worked fine, but the results were hard to eat–the leaves really too hard to handle, the ribs hard to eat around, etc. It needed the approach artichoke leaves get, but kale leaves are too big for that to work well. Many thanks, NancyB. We so appreciate it! Do you think you could grill the kale leaves on George foreman grill? Actually, no, Judy, I don’t. I’m sorry. The way the George Foreman grill is made, the kale is going to steam, not grill, and they’re going to turn soggy. Plus the smoke flavor is really what makes these special. 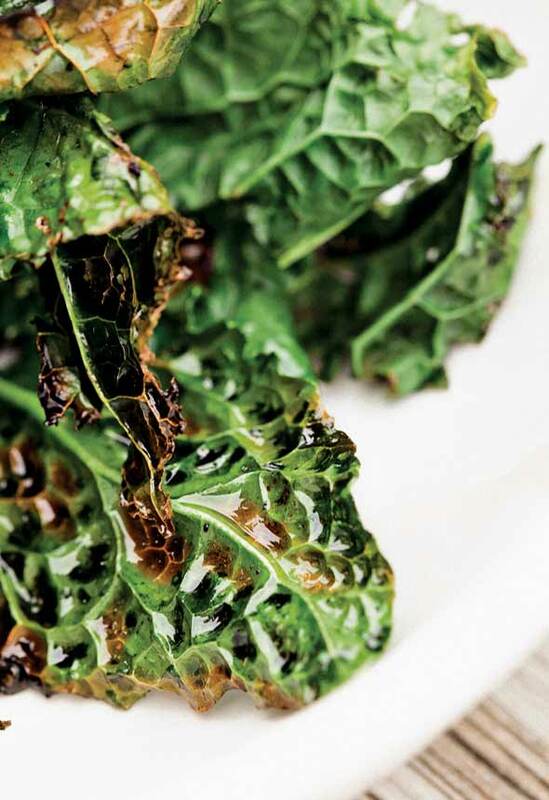 Perhaps you’d care to try our kale chips made in the oven…? First batch I grilled turned out great! Light, crisp, smokey. But the next time, the leaves shriveled up, got mushy, and shrank!! I couldn’t believe it! I guess it does matter what type of kale you use. They all look the same to me. Yes, E, perhaps the type of kale contributed to the situation. What kinds did you use? And I wonder, did you pat the kale completely dry prior to grilling it the second time? What you experienced sounds suspiciously like what happened to us when we were rushed and didn’t dry the kale as thoroughly as we ought to have done. Thanks for the advice. I tried to grill a batch this evening and made sure it was dry. I squeezed it in paper towels. The kale still shriveled and never got crispy. It must depend on the type of kale. Thanks for letting us know, E. What kind of kale did you use tonight that shriveled? We’ll make a note in the recipe so it doesn’t happen to anyone else. Thank you!